With the Oculus Rift now arriving on people's doorsteps, it's time to smash it apart. Or at least that's what the folks at iFixit have done, revealing the secrets behind the Rift's VR magic. As is the way with all iFixit jobs, this teardown isn't just for the fun of it, but to discover how easy it is to repair the Rift should you break it. The CV1 is more tightly designed than the earlier development kits - as you'd probably expect - and therefore not as easy to fix. It is, however, pretty easy to tear apart. iFixit's teardown also shows us how Oculus replaced the DK2's single 1080p display with a pair of displays, while also explaining the strange, sloped shape of the lenses. The CV1 was scored a seven out of ten for repairability. 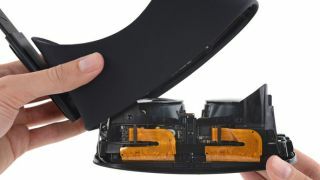 "Replacing the headstrap is impossible without cutting through the fabric on the headset", iFixit explained, while the intricate design makes it tricky to remove the display lenses and the motherboard. Oculus Rift founder Palmer Luckey saw the video, but wasn't impressed by the depth iFixit had gone to. He tweeted: "Come on, @iFixit, you can go further than that!"